Since there can never be one mattress pad that is perfect for everyone, we offer 3 different comfort levels to meet your needs. The 1.25" Uncovered UltraFoam, 3" Uncovered BodyFoam and 3" Memory Lite mattress pads are our softest visco-elastic foam and is recommended for those who prefer a soft mattress or mattress pad. The 5lb Memory mattresses and pads are made from a medium density visco-elastic foam and are for those who don't like the firmer 6lb or very soft 4lb mattresses. The 6lb Memory foam mattresses and pads are for those who prefer a firmer memory mattress that is more comparable to ones found in most area malls and back stores. UltraFoam is a new egg-crate style 1.25" memory foam that does not include a terry cloth cover. Replacement 3" Mattress Pad and 8" Mattress zippered terry cloth covers can also be purchased. AIRBED AIR MATTRESSES - Choose from economy to our raised supreme AirBed Air Mattresses. Ordering Info. AIRBED PUMPS - Manual and electric pumps are available. Ordering Info. AIRBED AIR MATTRESS WITH MEMORY FOAM TOPPER - 20" Raised Air Bed has a Wireless Remote to easily control the 120V AC Air Pump! Includes an easily removable Memory Foam Topper Pad!! Optional Back Rest Bed (approx. 62x96x41") also makes it easy to sit up and watch TV! Ordering Info. MEMORY LITE MATTRESS PADS - Softer Density 4.3 lb memory foam. Same Revolutionary technology as our Memory Lite Pillows in a 3" Mattress Topper Pad. It reacts to the temperature of the body to form to the head and body, giving proper support while maintaining softness. Hypoallergenic, anti-bacterial/fungal. Ordering Info. MEMORY 5lb MATTRESS PADS - Medium Density 5.0 lb memory foam. Same Revolutionary technology as our other Memory Products. It reacts to the temperature of the body to form to the head and body, giving proper support while maintaining softness. Hypoallergenic, anti-bacterial/fungal. Ordering Info. 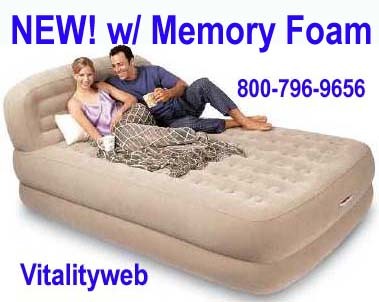 MEMORY FIRM 6lb MATTRESS PADS - Firm Density 6.0 lb memory foam. Same Revolutionary technology as our Memory Pillows. It reacts to the temperature of the body to form to the head and body, giving proper support while maintaining softness. Hypoallergenic, anti-bacterial/fungal. Ordering Info. ULTRAFOAM MEMORY MATTRESS PADS 1.25"- Soft 4 lb density viscoelastic memory foam. Patented Ring of Air design helps circulate air around your body, further enhancing the comfort of the sleeping surface. Utilizes a four-zone design and a unique combination of temperature-sensitive "memory foam" that gently molds to the contours of your body providing full support and ultimate comfort. $55-$109 Ordering Info. MEMORY LITE MATTRESSES - Softer Density 4.3 lb memory foam. Same Revolutionary technology as our Memory Lite Pillows in a 8" Mattress. It reacts to the temperature of the body to form to the head and body, giving proper support while maintaining softness. 8" Mattress only, we do not currently sell box springs or frames. Hypoallergenic, anti-bacterial/fungal. Ordering Info. MEMORY 5lb MATTRESS - Medium Density 5.0 lb memory foam. Same Revolutionary technology as our other Memory Products. It reacts to the temperature of the body to form to the head and body, giving proper support while maintaining softness. 8" Mattress only, we do not currently sell box springs or frames. Hypoallergenic, anti-bacterial/fungal. Ordering Info. MEMORY FIRM 6lb MATTRESS - Firm Density 6.0 lb memory foam. Same Revolutionary technology as our Memory Pillows. It reacts to the temperature of the body to form to the head and body, giving proper support while maintaining softness. 8" Mattress only, we do not currently sell box springs or frames. Hypoallergenic, anti-bacterial/fungal. Ordering Info. 10 YEAR WARRANTY ON OUR VITALFOAM MATTRESSES AND PADS! !